Yoga has been around and being practiced by people since the early civilization and it became known to the educated western public sometime in 19th century. The word Yoga is of Sanskrit origin and it views to attain a state of "permanent peace." It involves stretching exercises, controlled breathing and relaxation. Photo retrieved from Wikimedia following the Free Art License on December 15, 2013. 1. Yoga lowers the level of anxiety and depression. It is believed that Yoga stimulates the release of GABA---a chemical in the brain that is responsible for calming the excited nerve impulses. 2. It may be effective in managing chronic low back pain. 3. Yoga may reduce asthma attacks for asthmatic patients. 4. It may reduce high blood pressure and may lower other cardiovascular risk factors. 5. Yoga is a great physical exercise and helps you stabilize breathing patterns. 6. Yoga may help you sleep better and longer. These are only few of the many benefits of Yoga. There are books and videos widely available online that could help you understand Yoga better. For a beginner, it is best to find an instructor who could help you. 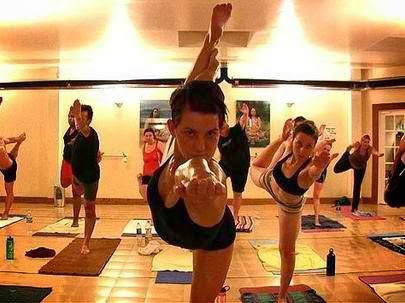 You may attend classes with your friends and enjoy every minute of the poses your instructor asks you to do. This post is made possible by: Yoga Teacher Training Program in Thailand, Single Brown Female, and Anything Psych.